Google Now for all! Personal assistant app coming to Google homepage? Google is preparing to turn its Google Now application into a personalised homepage, which works universally across all web browsers, judging by a dip into the source code of a company test page. The Android 4.2 Jelly Bean feature, which brings users time and location-based updates, has been a huge success since launching in 2012, prompting intense speculation that Google will soon make it available for iOS and within the Chrome web browser. However, if the suspicions of the Google Operating System website are correct it will also be rolled out to the Google.com homepage, presumably for for those logged into Google accounts like Gmail. "It looks like Google Now won't be limited to Android, iOS and Chrome," the site wrote. "It will also be added to Google's homepage. Some code from a page that's tested by Google offers more information about this feature." Is this an iGoogle replacement? The code displays text like "Get started with Google Now. Just the right information at just the right time," while the wording 'now_card' is also another notable feature within the code. A personalised Google homepage is an interesting concept, but not a foreign one. The company has offered the iGoogle solution since 2006, offering email, news stories, YouTube videos and weather. That service will be shut down this November. 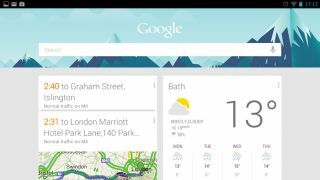 Is Google Now, as some have today speculated, a ready-made replacement? We may find out as soon as Google IO in three weeks time.